A woman is cooking at the stove. Lima beans are a good source of protein, offering 14.7 grams per cup. 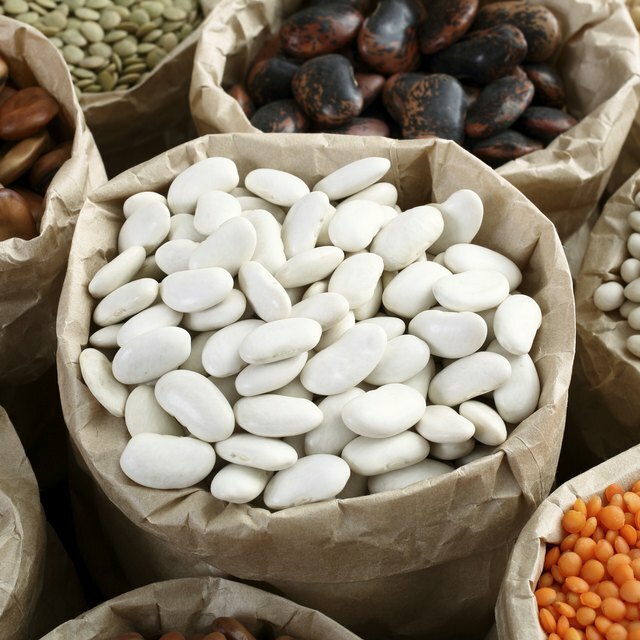 These protein-rich beans only provide 216 calories, and around 0.7 grams of fat. Despite their nutritional benefits, the somewhat bitter taste of lima beans isn't for everybody. If you want a sweeter source of low-fat protein, you can cook butter peas instead of fully grown lima beans. According to the cookbook “Nathalie Dupree's Southern Memories: Recipes and Reminiscences,” butter peas are small lima beans, packed with a sweeter flavor than mature lima beans. Cooking butter peas requires a few basic kitchen items and less than an hour of your time. Add freshly shelled butter peas and 1/2 stick of butter to the water. Depending on the grocery store you frequent, butter peas are often sold as butter beans or baby lima beans. Use a vegetable oil-based imitation butter spread for fewer calories added. Reduce heat to medium-low and cover the saucepan. Simmer for 20 to 30 minutes, until the beans are tender but not mushy. Remove the beans with a slotted spoon and place them in a serving bowl. Cover the serving bowl with a plate or kitchen towel to keep the beans warm, and simmer the buttery water for another 5 to 10 minutes until only a thin layer of water remains. Cover the lima beans with the reduced buttery liquid.